Our CarryMax™ Heavy-Duty Trailers are designed to carry your heaviest loads with ease. They can carry up to 30,000 lbs. 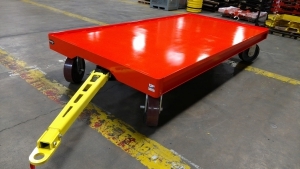 each and can be designed as true flatbeds (without leads or corner captures), or including those or other design possibilities which you desire. Our standard build 10,000 lb. CarryMax™ includes a quad-steer design for precise turning and maximum stability. An extended tongue and ring for latching into an alligator hitch receiver is also standard and recommended. These trail very well using our materials for tugging in trains. Our prices are impressive, too. 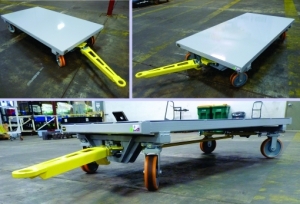 Call a J-tec Account Manager today to discuss your needs for these monster carts!